In an earlier post, we discussed some fantastic Santa Fe Daytrips to the northern region, but these aren’t the only magnificent Santa Fe daytrips at your disposal. At Four Kachinas Inn, we’ve also put together 3 additional daytrip ideas for you to enjoy; one to the west, to the east, and one down south. Our Santa Fe daytrip to the west takes you through the ruins of an ancient civilization, a high-tech research center (birthplace of the atomic bomb), traditional Pueblos, and the collapsed center of a long-dormant volcano. Here, you’ll find the San Ildefonso Pueblo, the Bradbury Science Museum, and an abundance of outdoor recreation. 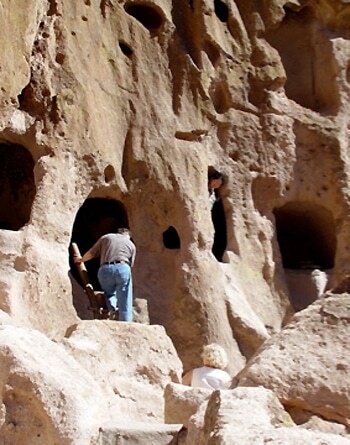 The recreational highlights include Bandelier National Monument, where you’ll find thousands of ancestral pueblo dwellings among the pink mesas and sheer-walled canyons, and Kasha-Katuwe Tent Rocks National Monument. Valle Grande is one of the largest collapsed volcanic calderas in the world, and is the perfect place to experience the solitude of the Santa Fe outdoors. End your day relaxing in the mineral waters of Jemez Springs. Head east out of Santa Fe, and you’ll run into pecos and Las Vegas–the “other” Las Vegas, which was a traditional Spanish Colonial style frontier railroad town that was part of the famous Old Santa Fe Trail. In this beautiful area, you’ll find plentiful fly fishing for brightly colored wild brown trout as well as native Rio Grande Cutthroats along the Pecos River. Head deeper into the Pecos Wilderness Area, where hiking and horseback riding opportunities abound. 12,000 years of history, including the ancient pueblo of Pecos, Colonial Missions, Santa Fe Trail sites, and the site of the Civil War Battle of Glorieta Pass, are all located within the Pecos National Historic Park. Also in the area is the The United World College-USA, which was was founded in 1982 and is home to the famous Montezuma Castle. Finally, if you just can’t get enough of the Santa Fe region, head south along the Turquoise Trail. This beautiful Scenic Byway will take you through old mining towns, scenic prairies, and majestic mountains. Stop in at the Allan Houser Compound, where you’ll find 85 sculptures created by renowned Apache artist Allan Houser, who is often considered the most influential Native American artist of the 20th century. You’ll also stumble into the charming towns of Cerillos and Madrid, the latter you might remember from the movie “Wild Hogs”. This formerly thriving town is now home to a wonderful 60’s counterculture filled with artists, galleries and crafts shops, antique and import stores, as well as a local jazz festival. While there, stop in to The Mine Shaft for live music, a seasonal melodrama performance, and a refreshingly cold beer. Stop in to the remains of Golden, an old mining ghost town and the home to the picturesque San Francisco church. The Tinkertown Museum, an amazing 22 room mansion filled with hand carved figures assembled into automated dioramas, is just a few more miles down the road. 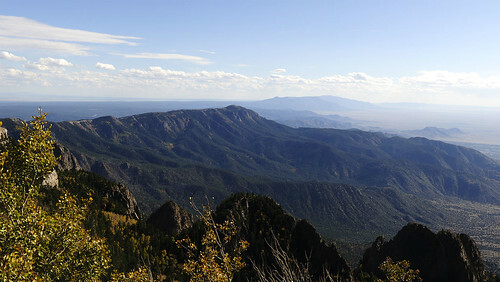 End your journey south taking in the stunningly beautiful views atop the 11,000 ft. Sandia Crest. As you can see, pick any Santa Fe daytrip, and you’ll immerse yourself in a world of rich cultural traditions and a fascinating history. Book your stay with us now; your Santa Fe adventure awaits!